Slow Cooker Moroccan Turkey and Lentils is a delicious way to put an exotic twist on turkey! Perfect for the holidays or an easy dinner any night of the week and any time of year! Anyone getting nervous about how the calendar keeps slipping into another holiday season? I sure am. I’m certainly not ready for the stress the holiday season brings because things have been so stressful the past three or four weeks. As I mentioned in a previous posting, my father and sister were in a car accident. My sister sustained minor injuries and was able to go home from the hospital the following day. However, my father’s injuries were more severe. Every rib on his right side and two on his left were fractured. He also suffered a collapsed lung and a gash on his arm. He spent five days in ICU, several more in general care and is now in rehab. Hopefully, he’ll be able to go home next week. He’s very healthy for his age (91) which is working to his benefit. As serious as it was, thankfully it was not more serious. But OMG, talk about WORRY some days that complications may arise! The fact that he IS healing is going to make for a most thankful Thanksgiving! Now, I LOVE a traditional Thanksgiving. However, I’ve also stressed and practically made myself crazy over getting everything done on time. If you’re not much into the big traditional Thanksgiving with the big old bird, this super-easy recipe for Slow Cooker Moroccan Turkey and Lentils is one you can get marinating the day before, then simply pop it into a slow-cooker, go watch some football and ENJOY your day off. You’ll see two different types: A green herb-based sauce and another spice-based (heavy on the paprika) such as the one I used. Mix up the marinade, add the turkey and refrigerate for 24 hours. Afterward, drain off some of the olive oil so your dish doesn’t end up too oily. There are many different types of lentils. I used green lentils here. They take longer to cook than regular brown lentils but they’re perfect for a slow-cooker. If using brown, you may end up with a brownish “sauce” instead of a lentil dish. When working with lentils, be sure to look them over carefully for any sticks, stones or odd-looking dried-up misfit-looking lentils. Not good and not good for your teeth! Add the tomatoes near the end of the cooking process. 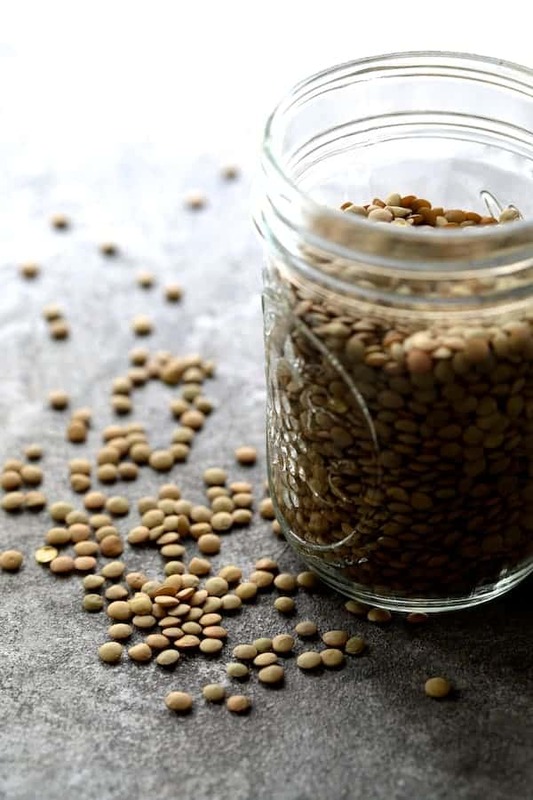 Dried legumes such as lentils or beans do not like salt and acid. (Tomatoes are acidic.) While there is a little bit of salt and acid in the marinade, it’s not very much and much will drain out when you drain out the oil. Allow the turkey breast to rest a little before slicing. Add some cilantro springs and some fresh lemon slices and WHOA! Delicious! Easy! 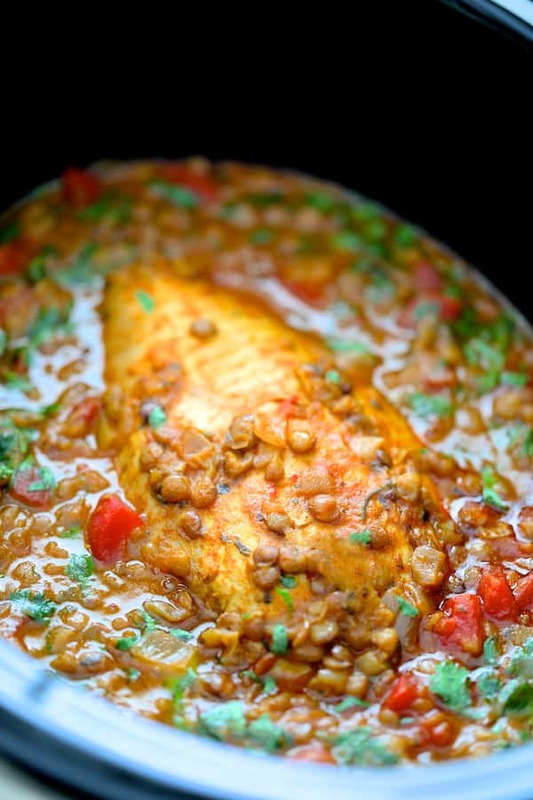 Slow Cooker Moroccan Turkey and Lentils. AND…. you were able to watch football all day! 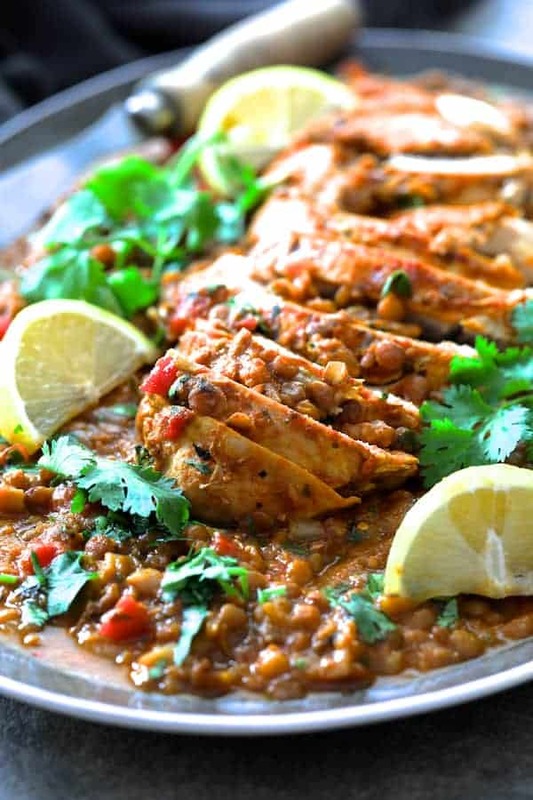 Slow Cooker Moroccan Turkey and Lentils is a delicious way to puts an exotic twist on turkey! Perfect for the holidays or an easy dinner any night of the week and any time of year! CHARMOULA MARINADE: Combine marinade ingredients in a 1-gallon zipper-top bag. Add the turkey breast half and massage the bag to distribute the marinade evenly over the turkey breast. Refrigerate overnight. TURKEY AND LENTILS: Spray the insert of the slow-cooker with nonstick cooking spray. Remove the turkey breast from the marinade and place it in the slow-cooker. 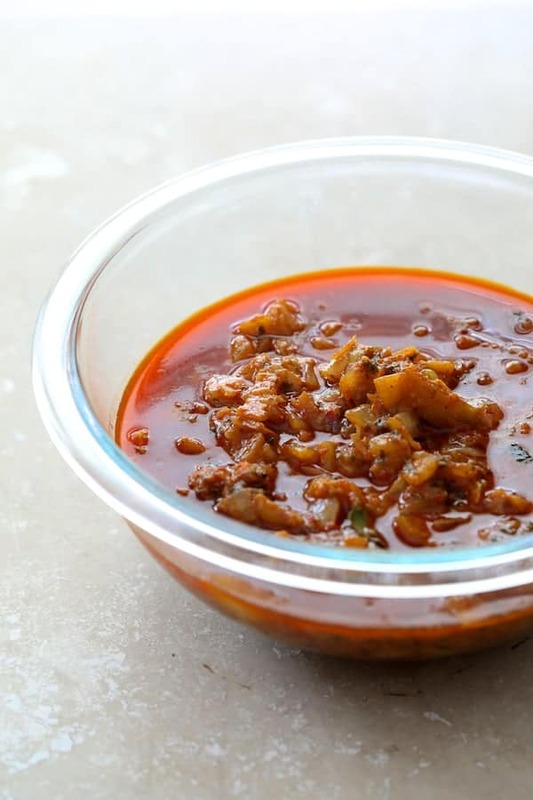 Drain the excess oil from the marinade through a sieve and discard. Place remaining marinade ingredients in the slow-cooker around the turkey breast. Add the lentils and chicken broth. Cover and cook for 4 hours on HIGH or 8 hours on LOW. When the turkey and lentils have about a half hour to go when cooking on HIGH or an hour to go on LOW, stir in the tomatoes. When finished, remove the turkey breast and let rest for 5 minutes before slicing. Remove bay leaves. Add cilantro to the lentils and season to taste with salt and black pepper. 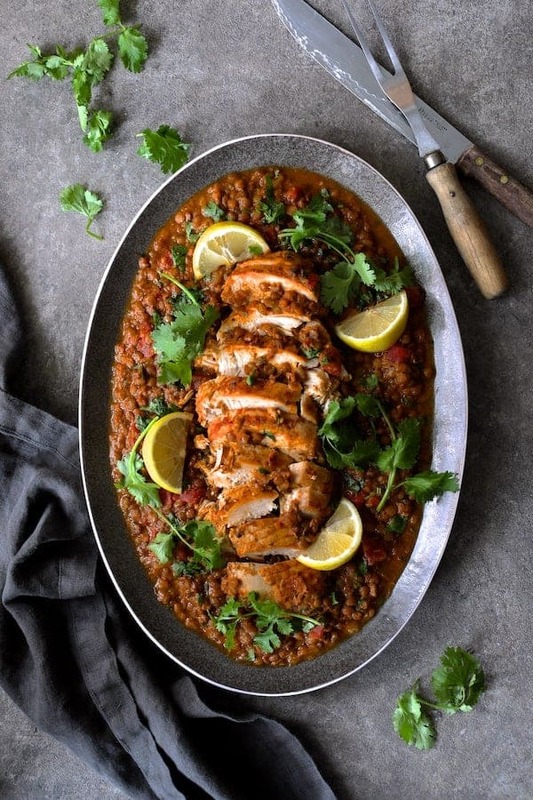 Serve turkey sliced on a platter over the lentils, garnished with cilantro sprigs and lemon wedges. I hope everything turns out well, and that he feels better soon! Have a happy Thanksgiving. This recipe looks yummy, love Moroccan flavors. Thanks, Stine! He is recovering physically, but the accident has taken it’s toll on this spirits. He’s such an active guy that it’s tough being housebound for him. Thank you again! Oh wow, definitely a lot to be thankful for this year- so glad to hear your family is recovering! I’m all about a traditional Thanksgiving, but also LOVE the idea of dishes like this one!! Thank you! Yes, we will be counting our blessings for sure! I hope your father gets better soon and goes home! Lots of health to him and to your family. The recipe looks delicious! Thank you, Julia!!! It’s been rough. Tough to see someone so wonderful that you love so much in so much pain.